A school in northern Malaysia has had to shut temporarily to handle what local media have called a case of "mass hysteria". It started last week with several students and teachers of the school in the city of Kota Bharu claiming that they had seen spirits or had supernatural experiences. School authorities shut the school and called in Islamic traditional experts, scholars and even witch doctors in prayer sessions and "exorcisms". By Sunday, the school had reopened and school officials said things had gone back to normal - but questions remain and the case continues to generate intense interest in Malaysia. The school, SKM Pengkalan Chepa 2, is located in the highly traditional and religious state of Kelantan. Last week, a small group of students began claiming they had seen a "black figure" lurking in the school. Soon, more students and even teachers claimed to have seen the same figure or experienced a supernatural presence. One teacher told local news channel Astro Awani that she felt a "heavy" presence was hanging on to her, while another claimed that a "black figure" was attempting to enter her body. A student meanwhile told newspaper Sinar Harian (in Malay) that he felt numbness in his hands while his mind "was all over the place". About 100 people, mostly students, were affected, a senior school staff member confirmed to the BBC. "Our students were possessed and disturbed [by these spirits]. We are not sure why it happened. We don't know what it is that affected us," she said. "But the place is a bit old, and these children can be disobedient and sometimes throw their rubbish around the school grounds. Perhaps they hit some 'djinns' and offended the spirits," she added, using a local reference to ghosts. The school shut on Thursday and invited Islamic preachers to recite the Koran and conduct prayers in the school. Local education authorities are also sending counsellors to the school this week. The Kelantan state education department did not respond to queries from the BBC. Based on the media reports, Robert Bartholomew, a sociologist who has researched mass hysteria in Malaysia, called it a textbook outbreak in an email to the BBC. Mass hysteria or collective delusions are defined as the spontaneous and rapid spread of false or exaggerated beliefs within a population. Outbreaks usually occur in small, tight-knit groups in enclosed surrounding such as schools, orphanages and factories. Several famous cases of mass hysteria or collective delusion have been documented throughout history all over the world - including "dancing mania" centuries ago, in which people reportedly would start dancing uncontrollably for hours. In 2012, LeRoy, New York made headlines with high school students developing strange tics and verbal outbursts with no obvious cause. Eventually the New York state department of health found that those involved - mostly girls - were suffering from conversion disorder, a form of mass hysteria. In South East Asia, during the 1970s there were several reported cases of mass hysteria outbreaks at factories in Singapore and Malaysia. Mr Bartholomew, who once lived and did research in Malaysia, said the phenomenon is quite common in rural areas of the country. In 1987 there was an outbreak involving 36 Muslim girls in a Malay hostel in Alor Star, Kedah which Mr Bartholomew said had lasted five years. "The outbreak involved shouting, running and mental confusion, crying, bizarre movements, trances and spirit possession. The girls, ages 13-17, complained of too much religion and study, and too little recreation," Mr Bartholomew said. "Malays are susceptible because of their belief in an array of spirits," said Mr Bartholomew, adding that outbreaks tend to occur in all-female boarding schools as they are the strictest. So what could have caused it? Existing fears or beliefs often influence what is blamed for mass hysteria incidents - for example in LeRoy the HPV vaccine was first suspected followed by a decades-old chemical spill in the area. 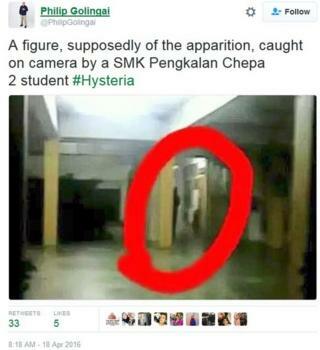 In Kota Bahru, school officials are pointing to the supernatural. In some cases one person sets off a mass episode that is then exacerbated or prolonged by various factors. In the case of LeRoy, New York some doctors said it had been sparked by one student actually diagnosed with Tourette syndrome. Mr Bartholomew says his research points to deeper underlying causes in Malay girls who have been sent to boarding school. "They are reluctant to attend such schools, where overcrowding is rife and privacy non-existent," he says. "Frustration and anger build over weeks or months. Eventually a single student becomes 'possessed' and is a seed or catalyst for the unfolding drama." In the Alor Star case, school officials brought in witch doctors to help. "The use of so many bomohs and native healers can be a double-edged sword, especially if they fail, because they legitimise the supernatural aspects of the outbreak. As a result, the outbreak is likely to be prolonged." Social media and media attention have been blamed for exacerbating the outbreak in some cases. Dr Wan Zumusni Wan Mustapha, a university lecturer who lived and taught in Kelantan for 13 years, however, thought the incident had been blown out of proportion. "It could have just been brought on by heat, stress or the haze," said Dr Zumusni, from the Universiti Teknologi Mara in Seremban. Video What is causing mystery illness at US high school?